No one paid much attention to the 21,000-tonne oil tanker Morning Glory as it churned back and forth along the north African coast earlier this month. 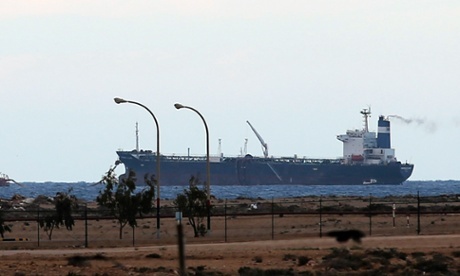 Tankers are a common sight, carrying Libya's oil exports around the world. But on 1 March it switched off its satellite transponder and vanished from world shipping maps. Eight days later it appeared at Libya's biggest oil port, Es Sider, blockaded since the summer by a rebel militia. Within a week its arrival would see a prime minister sacked and Libya on the brink of civil war. Four hundred miles away in the capital Tripoli, prime minister Ali Zeidan, 63, a lawyer and former dissident based in Geneva, was alarmed. He had come to the job 15 months before with high expectations. Libya, freed with Nato help from the Muammar Gaddafi dictatorship, had everything going for it, with Africa's largest oil reserves and only 6 million people to share the wealth. Instead, he had endured a bruising ride. Forty years of brutal, idiosyncratic dictatorship had left the country on its knees. Schools, hospitals, roads, pensions, commerce, the courts and police needed an urgent overhaul and he lacked the trained civil servants to do it. Worse, he was at loggerheads with the Islamist-led Congress that appointed him. When a militia briefly kidnapped him for six hours in October, he emerged to accuse the Muslim Brotherhood, whose Justice and Construction party leads the Islamist coalition, of "undermining" him. Since then, Islamists and a growing body of allies had campaigned to sack him, blaming Zeidan for Libya's woes. Worse still, the militias that had won the revolution were now fighting each other in a bewildering array of shifting alliances, deepening an economic malaise and scaring off foreign investors. But the arrival of the Morning Glory was more serious still. Oil and gas account for 95% of government revenues, and most Libyans depend on the state for salaries or handouts. Since the summer, militias in the east and west of the country had blockaded oil ports and fields, demanding more oil cash for the regions and slashing energy production. That had been bad enough. The prospect of the eastern rebels actually selling the oil promised disaster. Normally taciturn and professorial, Zeidan threatened to attack the tanker and sink it if it tried to leave. In Es Sider, Ibrahim Jathran, 33-year-old leader of the rebels, was unflustered, greeting the Morning Glory's arrival with celebrations that included slaughtering a camel on the quayside. Charismatic and tough, he made his name leading a militia in the revolution and was later appointed head of the army's oil protection force. Last year he set up the Cyrenaica Political Bureau, named after the eastern province that contains two-thirds of the country's oil, and seized key oil terminals. Many Cyrenaicans were ambivalent, agreeing the east needed more state help, but unsure this unelected body was the way to get it. Opponents accuse Jathran of planning a breakaway state, something his supporters deny. "All of this is against the Muslim Brotherhood, not against ordinary Tripolitanians," said Jathran's spokesman, Essam Jimani. "We don't want independence. But if the Muslim Brotherhood are too powerful and it led to civil war, we would be forced to become an independent state." The arrival of the Morning Glory also rang alarm bells in the west. Libya was already a worry, with the growing presence of Islamist radicals and waves of migrants from sub-Saharan Africa using it as a springboard for Europe. Nato was the midwife for Libya's Arab spring revolution, its bombing devastating Gaddafi's forces, and a descent into anarchy would affect the reputations of Barack Obama and David Cameron, prime movers in that war. Now a new reason was emerging for keeping Libya stable; its gas, piped to Italy, was a valuable alternative source of energy to a European Union dependent on supplies from an ever more erratic Russia. Western diplomats liked Zeidan: some conceded he lacked charisma, but they saw in him a liberal mediating force between Libya's factions. And London, Paris and Washington agreed that Congress should be supported as the vital underpinning of Libyan democracy. While Morning Glory was taking on oil, US ambassador Deborah Jones declared that Jathran's actions amounted to "theft from the Libyan people". Last Monday, unperturbed by threats against it, the tanker, loaded with a cargo valued at £20m, slipped her moorings and a new factor entered the equation: the weather. Howling winds, driving rain and heavy seas met the Morning Glory as she put to sea. Zeidan ordered armed forces to intercept, only to find the cupboard almost bare. Libya's few major warships were upside-down in Tripoli harbour, the result of Nato bombing in the revolution. Its air force was in near mutiny over changes to its command, with three air bases in open revolt, and no bombers took to the air. Instead Zeidan turned to the Libya Shield, a loose alliance of revolutionary militias. A unit in Misrata, 280 miles up the coast, commandeered a tugboat, lashed jeeps mounted with rocket launchers and anti-aircraft guns to the decks, and set sail. Morning Glory: "Don't fire, don't fire. We have security on board we cannot do anything." Gunboat captain: "We are not firing. Could you change the course to Misrata, please. Have you taken your map to see Misrata port, please?" Morning Glory: "I cannot do anything, the security on the bridge, the security on the bridge, with the guns. Security on the bridge with the guns, they cannot let me do anything, please don't fire, please don't fire." The exchange seemed to validate government claims that gunmen were holding the Morning Glory crew hostage, but the tanker outpaced the tug, which later encountered a patrolling US warship. Jathran had won. In Tripoli the rebel triumph was the last straw for Congress, which sacked Zeidan, replacing him with former defence minister Abdullah al-Thani. Hours later, prosecutors charged Zeidan with corruption and issued a travel ban. The stage was set for a dramatic escape. At 9pm a private jet landed at Tripoli international airport, the pilot telling the control tower he was picking up diplomats. The plane parked on the VIP apron, but when a passport official turned up to check the passengers he was restrained by security guards while Zeidan got on the plane. It took off and headed for Germany, where Zeidan insisted he was innocent of corruption and denounced his sacking as a "falsification", claiming only 113 members voted to sack him, fewer than the minimum 120 required. He promised to return one day to Libya, but that may be some way off. On Saturday night, giving his first full-length interview since his ousting, Zeidan said he fled the country after friends warned him his life was in danger, and accused Islamists of being responsible for his sacking. Speaking from Germany to a private Libyan TV station, he accused the Muslim Brotherhood of wanting to "impose its will" on Libya and repeated his claim, denied by Congress, that his removal was unconstitutional. Congress, insisting its dismissal was lawful, decided on bold action. Misratan-led Libya Shield units, the most powerful in the country, raced east down the coastal highway to capture the rebel-held ports, running into a unit, not of rebels, but of army special forces at the coastal town of Sirte. In confused fighting five soldiers were killed, four incinerated when their vehicle was hit. Photographs of their badly burned bodies being returning to Cyrenaica spread across social media, inflaming public anger. A mixed force of Jathran's rebels, Cyrenaican militias and army units complete with howitzers was deployed at the Red Wadi, a valley blocking approaches to the ports. Trouble spread across the country. In the western mountains, next to Tunisia, the Zintan militia, allies of Zeidan, denounced his sacking and mobilised. The Zintan militia is second only to the pro-Congress Misrata militia in strength, and both are more powerful than Libya's tiny regular army. Zintani and Misratan militia units have frequently clashed in Tripoli, vying for control of key bases. Zintan also lies along the gas and oil pipelines carrying oil from western Libya to the coast. In concert with ethnic Berbers to the north and Tobu tribesmen to the south, it has periodically cut pipelines and occupied oilfields. Were it to side with Jathran's forces in the east, it would leave the central government facing an almost total oil blockade, and the prospect of resistance on two fronts. Adding to the confusion, leaders in the southern province of Fezzan met to consider breaking away from government control, while in Tripoli a militia stormed, looted and burned the HQ of the second infantry brigade. On Thursday, Congress speaker Nuri Abu Sahmain intervened, giving rebels two weeks to vacate the oil terminals in a bid to bring calm. Tribal elders from east and west met, hoping to find a breathing space. But that space is limited. The Islamists in Congress have strengthened their hand by sacking Zeidan, but at the risk of polarising the opposition. Congress is itself denounced by many for staying in office after its mandate expired last month, despite MPs arguing that Libya must have a parliament until the elections this summer. Many think a breakup is now a possibility. "Current conditions seem heavily stacked against a political solution," said Oliver Coleman, an analyst with British risk consultant Maplecroft. "There is an absence of any genuinely unifying figure to act as a bridge between Libya's factions. An Islamist-dominated Congress will find it extremely difficult to reach a negotiated settlement with Jathran, given his renowned animosity to the Muslim Brotherhood." Jathran's rebels have vowed to hold the Red Wadi, in what some see as a de facto partition of Libya. Among those seeking dialogue is Hassan El Amin, a Misratan former dissident who quit Congress and fled back to Britain in 2012, saying he had had death threats. He is now calling for the UN to mediate. "The west should realise the issue in Libya can get really out of hand, they don't want another Syria. When we were fighting Gaddafi they [the west] came in together. We need them again." As forces gather either side of the Red Wadi and Libyans prepare for more violence, one question remains unanswered – the fate of the Morning Glory. It was last seen late last week going east along the Egyptian coast, destination unknown. By then it hardly mattered, as news broke that a second tanker was heading for rebel-held ports.